HealthCloud POL allows for comprehensive management of instruments and their associated details, maintenance and calibration schedules, etc. Navigate to the Instrument Management Menu Item and click the New button. HCPOL displays the New Instrument Detail screen. 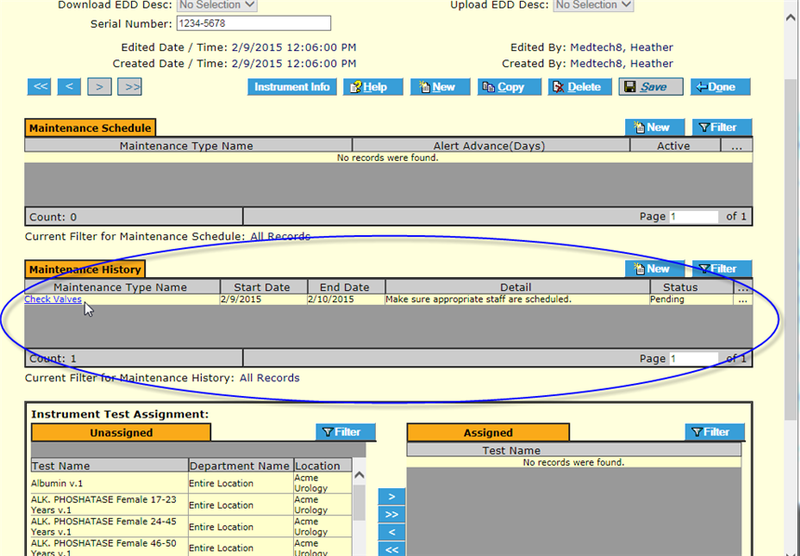 Maintenance History may be entered and/or tests assigned, and documents uploaded to the instrument by default. You can actually add both completed maintenance events and upcoming ones here. In the Maintenance History frame, click the New button. The Instrument Maintenance Detail screen displays. You may enter either upcoming maintenance or maintenance already performed. 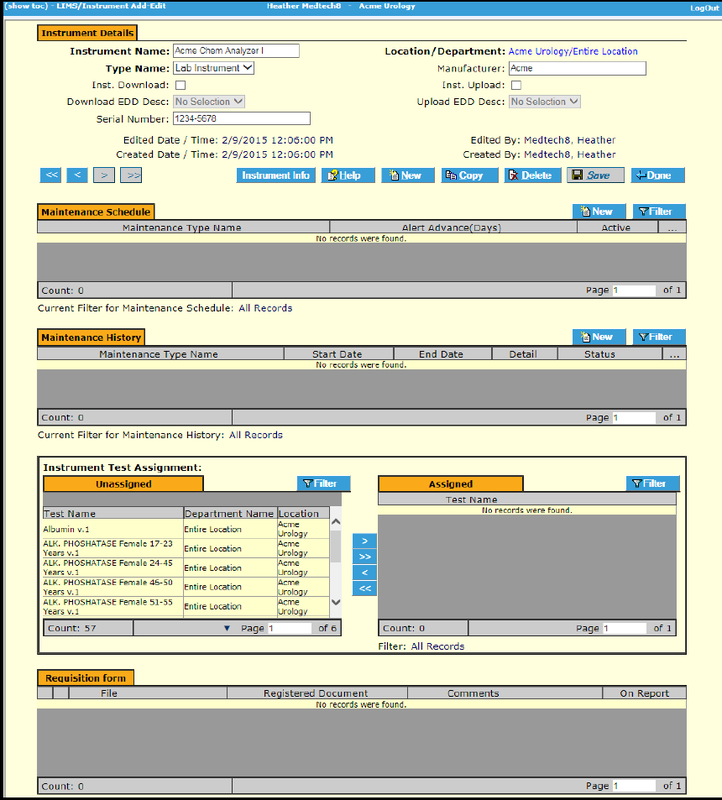 Select the type of maintenance, dates and other required or desired fields. Click Save . The record is saved and displays in the frame. Assigning tests to an instruments defaults the selected test to that instrument when selected for sample analysis. Note: Unless the instrument is ALWAYS used for that test it is best not to assign tests. In the Instrument Test Assignment frame, simply select from the unassigned tests (on the left) and click the Add Selected button. Alternatively you can use the Add All button. The Test(s) assignment is complete. Instrument Test Assignment frame showing assigned and unassigned tests. Tests may also be unassigned, or additional tests assigned using this feature at any time (any ongoing batches will be unaffected). When instruments are interfaced with HealthCloudPOL, the parameters (analytes) they measure must be mapped to the system using exactly the terms it sends. When this must be accomplished, it is done in the Parameter Mapping screen, which is accessed by clicking on the Instrument Info button on the Instrument Detail screen. 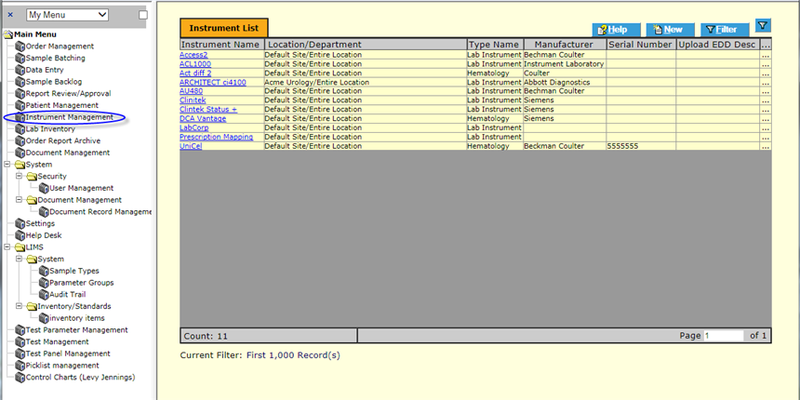 This will display the Parameter Mapping screen, where instrument fields are mapped to the LIS. 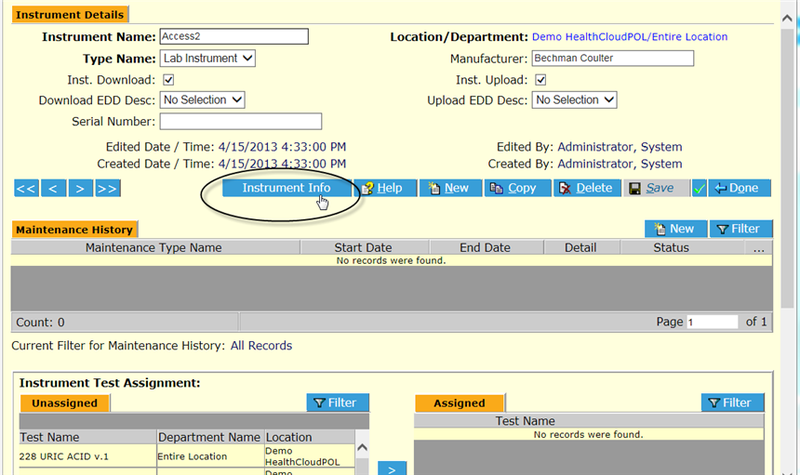 Enter Instrument terms in the left column, and select the corresponding HealthCloudPOL parameter (using drop-down selection) in the right-hand column and Save . 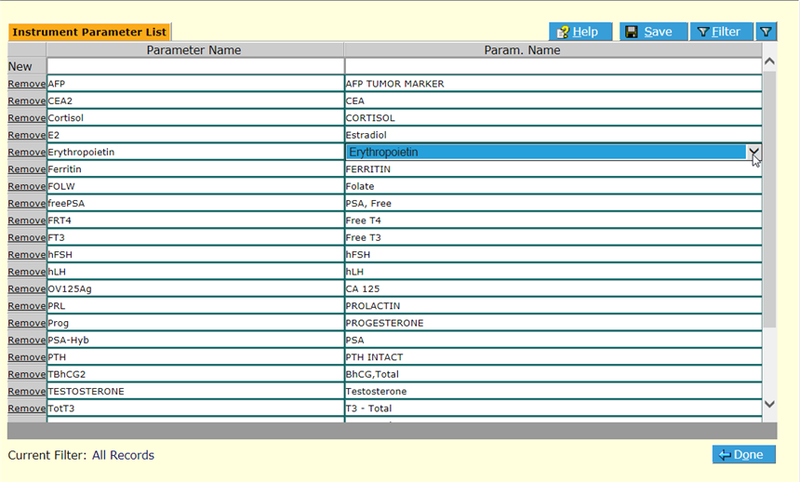 If the parameter does not show in the LIS column, it may be inactive or need to be created. See Test Parameter Management in the Administrator’s Guide. NOTE: It is important that the instrument’s parameters be entered exactly as shown in its manual, including case, spaces and any other characters.